In a move to remedy chronic staff shortages and improve conditions at the county jail, the Cuyahoga County Council recently discussed a planed contract with MetroHealth System to take over all jail medical operations. 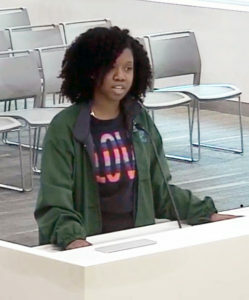 AFSCME Ohio Council 8 Staff Representative Carlisha Powell was on hand at the public meeting to stand up for members of AFSCME Local 2927 which represents 35 licensed practical nurses, social workers and other service employees at the jail. Powell noted that some county medical service employees have worked at the jail for more than two decades and asked the Council to protect their jobs. The union is asking that all the jail’s AFSCME bargaining unit employees be guaranteed jobs when MetroHealth takes over the operation scheduled for later this year. Nurses and other health care and support personnel at MetroHealth are represented by AFSCME Local 3360.